This hotel in Lake City features an outdoor pool with a sundeck and connecting patio and rooms with a refrigerator. Ichetucknee State Park is within 30 minutes of the hotel. All rooms at the Hampton Inn and Suites Lake City offer a coffee maker, microwave and cable TV. A work desk is offered in every room and some also have a seating area. Lake City Hampton Inn provides a daily continental breakfast for guests. A full-service business center and a gym are available on site. Hampton Inn and Suites is located near the Suwanee River where guests can enjoy fishing, canoeing and wildlife observation. Olustee Battlefield is within a 30-minute drive of the hotel and Lake City Medical Center is a 5-minute drive away. 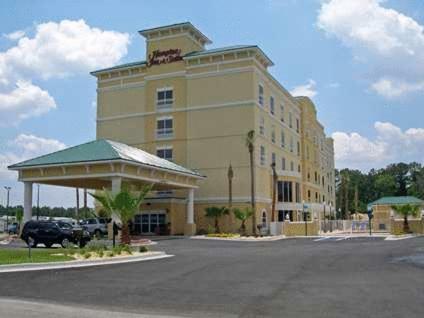 the hotel Hampton Inn & Suites Lake City so we can give you detailed rates for the rooms in the desired period.